Sedge islands, shore birds, "Ole Barney" and much more await the paddler on this popular NJ waterway. Add in boat traffic, wind and waves and this paddle will surely test your skills. A relaxing lunch on a quiet sandy beach will give you that needed break to re-energize for the return trip. We'll paddle the northern section of the bay on the spring trip and the southern section on the fall trip giving you the chance to explore it all. Note: If you are going to use your own kayak on this tour it must be at least 13 feet long. Ride your way through 7 sets of class I & II rapids on this tour. 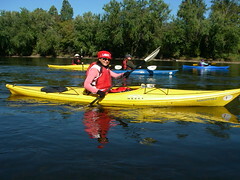 The river is big and wide and while the waves are lots of fun they're also easy to navigate for the novice paddler. Meander past beautiful mountains, over clean, clear water and relax in an afternoon swimming hole along the way. You're gonna love this one! With the 2.5 mile long Tappan Zee Bridge in the background, we'll launch into the river and paddle north glimpsing stately homes with beautifully manicured grounds. 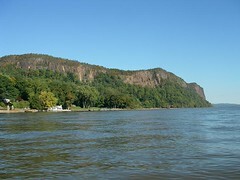 Just beyond is the grand Hook Mountain which rises almost straight up out of the river. Soak in the magnificence as we paddle past this geologic marvel. After lunching along the river we'll ride the outgoing tide back to our destination. 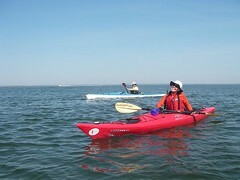 LBI is one of NJ's best vacation spots and a great place to go paddling. The spring is an especially nice time to be out on the water and away from the summer crowds. Come join us as we explore the numerous islands, sandy beaches and canals that are found along the bay shore. From the confluence of the Hackensack and Passaic Rivers to the Shooters Island bird sanctuary 5.5 miles to the south, Newark Bay is tucked away and seen by few people outside of its immediate area. Being one of the busiest commercial ports in the United States we are sure to see some big ships bringing their cargo in from overseas as we paddle and navigate the surrounding waters. Add in some historic bridges, cool industrial ruins, and a surprising amount of nature and you have a great day of exploration on the water. Directly south of Staten Island and the mighty Hudson River delta, Raritan Bay is an often overlooked, yet great kayaking destination. 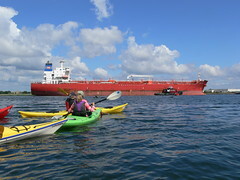 Numerous shoals, its proximity to the ocean, busy shipping channels and strong river currents feeding it make this bay a challenging place to paddle. With limited shoreline access come out and explore an area best seen by boat. We know about Sandy Hook's great beaches but how many of us know about its cool bay shores? 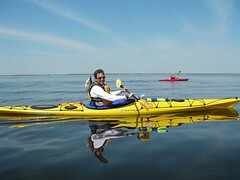 In our kayaks we'll explore islands, coves and estuaries seldom visited by others. We'll also get a chance to see old military ruins from a time when Sandy Hook played an important role in protecting NY Harbor. 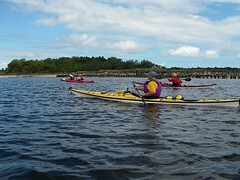 A bay crossing will offer some rougher water and interesting paddling conditions for experienced paddlers and if conditions are favorable we may even round Sandy Hook point for some fun in the ocean. 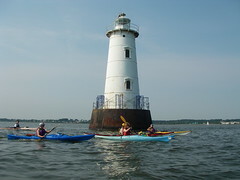 Also, see Intro to Open Water kayak class/tour on the classes page for an instructional kayak tour to the point of Sandy Hook. 240 years ago George Washington crossed the river here with his troops, preparing a surprise attack on enemy soldiers in Trenton. Today, we'll paddle up the canal and, after lunch, cross over to the river for a leisurely paddle back. 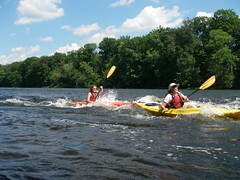 We'll end the day by retracing General Washington's historic trip in our kayaks.